Floorfixer can offer a professional sport floor sanding service for all types of sports / commercial floors. 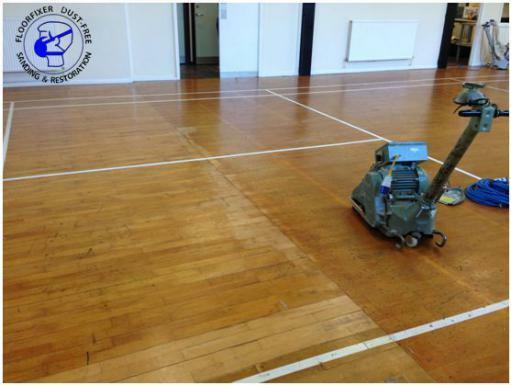 Sports hall floors, gymnasium floors, dance floors, aerobic studios - in fact any type of sports flooring can be restored or installed by our experienced floor sanding team. We are able to work to exact specifications; always within budget and we also provide an extremely high quality service. Multi-purpose sports flooring needs to be extremely durable and we can provide solutions for flooring to suit all budgets and requirements. With our exceptional project management skills, we will ensure that our team will finish the job to an exceptional standard, and within the specified timeframe. 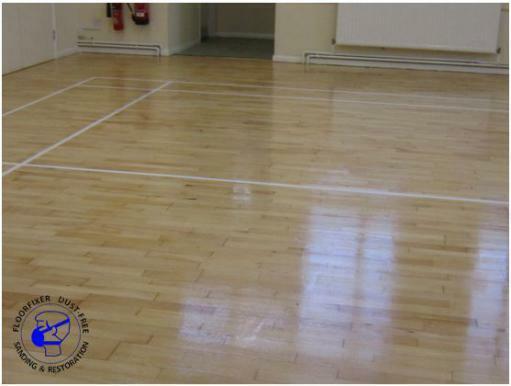 Our sport floor sanding team are fully qualified to refurbish every type of sports floor and they finish the job off with excellent non slip sealing products which are extremely durable. If requested, they can mark out the entire floor surface after the whole process of sanding and cleaning has been completed. Floorfixer have refreshed lots of sports floors for all sorts of sporting activities including basketball, handball, volleyball and gymnastics resulting in an effective surface together with long-term durability. All Floorfixer machinery is serviced and PAT tested regularly to meet industry standards which allows safer working processes for our operatives. See below the before and after pictures of a sports floor restoration project we recently completed at Milton Malsor in Northamptonshire.